DAB+ receiver for switch boxes. Listen to your DAB+ radiostation e.g. while you are cooking. Your children can stream their favorite music to the DAB+ Radio via the optional Bluetooth-/WiFi-receiver BTR/WR 55. Enjoy the amazing sound even with the „KEL Music“ loudspeaker installed in the switch box – you can get even better sound via external built-in speakers. In the bathroom, you can conveniently control the DAB+ UP Radio with the optional remote control e.g. from the bathtub. The new DAB+ UP radio receives DAB+ and FM tuner stations. Further, it has a back-side aux input for connecting another sound source, e.g. the Bluetooth-/WLAN receiver BTR/WR 55. 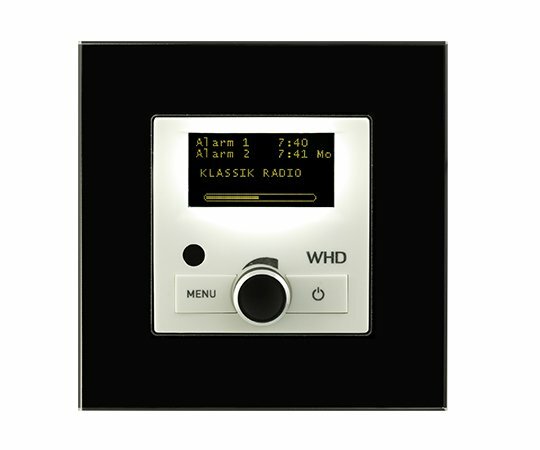 The WHD DAB+ UP Radio makes it possible to receive DAB+ radio stations in the switch boxes for the first time. 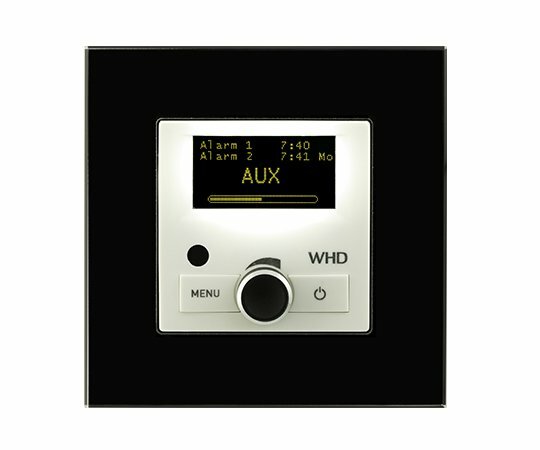 It is not just a radio – it’s a mini stereo system suitable in all common switch ranges with 55x55mm plate. You can still receive FM radio stations and even connect another sound source. The complete „stereo system“ is installed in the flush-mounted box. So you do not need any floor space for it and get music at the touch of a button. Just turn on the radio and enjoy! If you still want to stream your favorite music from your Smartphone/Tablet, you can extend the DAB+ UP Radio with the Bluetooth- or WiFi Receiver BTR/WR55. If you want the highest radio quality in the switch box at the moment, the DAB+ UP Radio ist the right choice for you. Of course it can also be retrofitted. Simply remove an older FM Radio and install the DAB+ Radio.